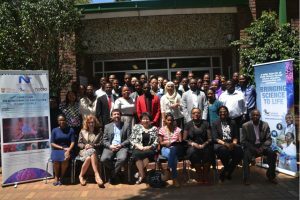 The South African Agency for Science and Technology Advancement (SAASTA) through the Nanotechnology Public Engagement Programme (NPEP), an initiative of the Department of Science and Technology (DST), and Nabio Consulting (Pty) Ltd presented a symposium on the impact of nanotechnology on cancer. The symposium was held on 25 October 2016 at the National Zoological Gardens (NZG) in Pretoria. Cancer is a leading cause of morbidity and mortality worldwide. According to a World Health Organisation (WHO) global report, cancer accounted for 8.2 million deaths in 2012. More than about 60% of the world’s new annual cases occur in Africa, Asia and Central and South America. “The aim of the symposium was to provide a platform for local researchers and industry to showcase ground-breaking academic and industrial research and promote development in the areas of cancer and nanotechnology,” said Dr Mthuthuzeli Zamxaka, Science Communicator: Nanotechnology Public Engagement Programme (NPEP) at SAASTA. According to Dr Steven Mufamadi, chair of organising committee, nanotechnology promises to revolutionise medicine in the 21st century, as it offers great potential to advance the prevention, diagnosis and treatment of cancer. Discussions at the symposium covered issues such as the cancer control programme of the WHO, cutting edge research in nanotechnology on cancer, intellectual property in publicly funded research, nanotoxicology, ethical aspects of nanotechnology and public-private partnership. The speakers were from WHO, Cancer Association of South Africa (CANSA), DST, National Research Foundation (NRF), SAASTA, the dti, National Intellectual Property Management Office (NIPMO), L’Oreal, Merck, NIOH-NHLS, the University of the Witwatersrand, the University of Johannesburg, the University of Western Cape and many more. Addressing the participants during the symposium’s first session, Mr Michael Ellis, SAASTA Science Communication manager, spoke about the role of SAASTA in science and technology development in South Africa and the importance of communicating science effectively. Dr Taskeen Khan from WHO presented on global cancer control and strategies towards cancer eradication in 2030. Dr Abdullah Ely from Wits University chaired the second session of the symposium. During this session, Dr Melia Wallace, CANSA head of research, highlighted the role of CANSA in cancer research support in South Africa. She also indicated that CANSA is one of biggest funders of cancer research in SA, with investments of R12 million per annum (pa) in research. Prof Anna Kramvis from Wits University spoke about the genotypes of Hepatitis B Virus Infection and liver cancer in sub-Saharan Africa. Dr Joseph Molapisi, Director of Emerging Research Areas from DST highlighted the importance of the code of conduct for responsible nanosciences and nanotechnologies research. He mentioned that researchers should follow the Nano Code of Ethics in order to minimise the unknown risks associated with nanomaterials. Ms Rebecca Molubi from NRF presented on driving the National Nanotechnology Strategy through research and postgraduate funding. Dr Buhle Moyo from Wits University shared her cutting edge research on biological nanoparticles against hepatitis B virus (HBV), the study showed significant viral inhibition when testing in Hepatitis B virus transgenic mice. Dr Manjula Bandla from TUT spoke on novel nanocomposites hydrogels for cancer drug delivery applications: A facile eco-friendly approach. Ms Livhuwani Nemandava from UJ highlighted the novel method for synthesis of nano-particles for colorectal cancer treatment while Dr Jillian Gardner from Wits University presented on ethical aspects of nanotechnology in medicine and healthcare. Prof Mary Gulumian from NIOH-NHLS urged that although nanotechnology promises great breakthroughs in solving the global challenges such as health, energy, water, etc., unintended effects on human health and environment are still unknown and more work still to need be done. She emphasized that the effects of nanoparticles on human health may not been seen today, but may be realised 20 – 30 years post exposure to nanomaterials. Dr Richard Moutloali from UJ chaired the afternoon session. During this session, Dr Tshenge Demana from the dti presented on the innovation support programme and highlighted government funding opportunities towards nanotechnology commercialisation. Mrs Helen da Fonseca shared a video with our delegates. The video highlighted the role of L’Oreal UNESCO for woman in science. Ms Usisipho Feleni from UWC, a recipient of L’Oreal award also presented her PhD work on smart bio-electrochemical sensing and signalling of inter-individual responses to breast cancer treatment. Ms Jetane Weyers from National Intellectual Property Management Office (NIPMO) explained the role of NIPMO, an entity within the Department of Science and Technology responsible for Intellectual property in publicly funded research and innovation. The symposium would not be a success without the support of our exhibitors namely, MERCK, Separations, Inqaba biotec, Mintek, CANSA, L’Oreal, AEC Amershan, ASSAF, SAINE etc. Dr Mufamadi Tel: +272756 3905, Cell: +2771316 8424 Email: Steven.Mufamadi@gmail.com.